New rules from the Ministry of Finance will allow local governments to issue bonds with longer-dated maturities, in an effort to increase their appeal to institutional investors such as pension funds and insurance companies. This could make it easier for local authorities to refinance maturing bonds and issue new debt, especially after tightened regulations require them to reduce the mismatch between the maturity of their bonds and the underlying projects they are meant to fund. Longer-dated maturities will also help build up a yield curve for Chinese local government debt — this is increasingly important as the authorities open up the domestic bond market to foreign investors and try to build a proper, functioning municipal-bond market with good liquidity. The new rules are part of a long-running multi-pronged strategy to clean up the murky world of local government debt, make it more transparent, and reduce the likelihood that it will create systemic financial risks. 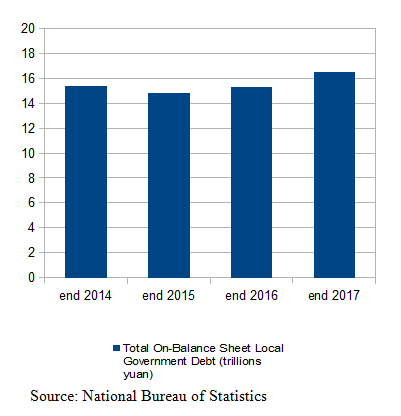 Official local government debt stood at 16.61 trillion yuan in March, within the official limit — although many estimates say off-balance-sheet borrowing is far higher. Up to now, local governments have only been able to issue short-dated bonds with a maturity of 1, 3,5,7 and 10 years for general bonds and special purpose bonds, although the latter also had the option of 2-year bonds. The new rules add 2-year, 15-year and 20-year maturities for ordinary bonds, and 15-year and 20-year maturities for special purpose bonds — these are meant to raise money for a specific project and are paid back from the income generated by the projects they fund, rather than fiscal revenue. Although there are limits to the proportion of longer-maturity bonds that can be issued in a year, they are likely to be a big help for local governments, who are set to issue 2.25 trillion yuan of new general and special purpose bonds this year, as well as 1.73 trillion yuan of bonds under a debt swap program started in 2015, and the refinancing of maturing bonds. This year, for the first time, special purpose bonds will make up the majority of local government bonds issuance, with a quota of 1.35 trillion yuan, up from 800 billion in 2017, and compared with 830 billion yuan for general bonds. The increased quota reflects the central government's policy of increasing the transparency of local government debt and forcing them to cut down on hidden off-balance sheet borrowings, usually done via local government financing vehicles (LGFVs). Local government bond issuance decreased by 30% last year from 2016, largely because local governments had carried over a fiscal surplus into 2017. In 2018 however, we expect issuance to hit the limits outlined above. Long-dated bonds are far more suitable for long-term infrastructure projects. They will lower liquidity risks because local governments won't have to keep rolling over their short-term bonds that are financing long-term investment and will give issuers more certainty as regards the interest rates they pay, even if they have to pay higher rates on the long-term debt. Currently yield spreads on local government bonds don't accurately reflect the risk profiles of different issuers, partly because of the implicit government guarantee that investors believe comes with the bonds. But the ministry wants to change that — the latest rules reiterate its intention to make the pricing of the bonds more market based, including improving the credit rating and information disclosure requirements. Another positive takeaway from the new rules is that the government is acting to make the market for local government bonds more liquid. Most bonds are sold on the interbank market, which is closed to retail investors, and most are never traded and are held to maturity by investors, mostly banks. That's hardly an attractive market for foreign investors, and the Ministry of Finance has been mulling measures to make the market more liquid. In its notice this week, the ministry reiterated intentions stated in a March document to broaden the investor base for local government bonds, by allowing commercial banks to sell local government bonds over the counter to non-financial institutions and retail investors. We think this is all potentially good news for the development of China's municipal bond market — but how quickly all these changes will happen is unclear. Caixin Insight, a sister company of Caixin Media, and U.S. asset manager Gresham Investment Management LLC have launched a new index that aims to become a benchmark for China’s commodity futures market. The reform and opening-up of China’s financial sector will continue regardless of trade tensions with the U.S., central bank Governor Yi Gang told a group of American policy advisers and scholars at a recent meeting in Washington. Regulators are drafting rules to put China's freewheeling financial conglomerates under stricter oversight, in a bid to control risks created by the companies’ aggressive and often debt-fueled expansions. Consumer prices in China rose at their slowest pace in three months in April as industrial price growth remained low, official data showed Thursday. The data provides more evidence that inflation pressure is easing in the world’s second-largest economy. China’s securities regulator has released draft regulations that set out more details for foreign investment in futures firms as part of an ongoing initiative to open up the financial sector. China’s supreme court has ruled that companies can’t own insurance-company shares through a custodian because of the dangers such arrangements pose to the financial system. Wu Xiaohui, the founder and former chairman of Anbang Insurance Group in his early 50s, has been sentenced to 18 years in prison for fundraising fraud and embezzlement at his financial empire. Corporate raider Baoneng Group unloaded more shares in property developer China Vanke Co. Ltd. as it continued with a disposal forced by the country’s financial regulators of part of a stake built up during its failed hostile takeover bid for the house-builder. ZTE Corp.’s main business operations have ceased due to a ban imposed by the U.S. government last month on the company from buying components from American firms. But China’s second-largest telecom equipment-maker is trying to have the sanction modified or reversed, it said on Wednesday.